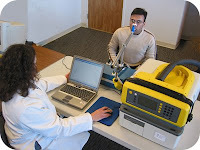 Breathalyzers seem a promising way of detecting both local halitosis, and bloodborne body odor/halitosis as well. This seems to be an area of research picking up, largely because it is thought they may be able to detect many serious health problems early through breath, and also it would be very practical in a frontline clinical setting (The Drs surgery). One pioneer is Dr Michael Phillips of Menssana Research, who had a dream of such of a device for testing. His company has built a breathalyzer that can detect volatile compounds at 'parts per trillion'. He will be talking at the Pittcon Conference in Chicago this year. ...This session will address the technical challenges of detecting volatile organic compounds excreted in the breath in picomolar concentrations (parts per trillion), the statistical challenges of extracting a disease signal from a noisy background, the clinical challenges of designing human studies that will yield clinically useful new diagnostic tests, and the regulatory and financial challenges of bringing these tests to the patient and the doctor. Admission fee: The on-line registration price is $95 before February 9, 2009; $190 after. It is posted in case anyone wants to go. He likely won't talk about halitosis. The Pittcon conference seems to be about spectrometers. Perhaps he will have a booth.